Successful entrepreneurs possess the ability to think creatively and identify opportunities in their environment. Wendy Newmeyer saw the potential of balsam branches, considered waste products in her husband’s logging business, and transformed it to sweet-smelling pillows and other gift items. Her company, Maine Balsam Fir Products http://www.mainebalsam.com based in West Paris, Maine, has become a premier source of aromatic pillows in the world, and Wendy was received the Maine Small Business Person of the Year Award from the Small Business Administration in 2000. Wendy and her husband Jack moved from East Brunswick, New Jersey to Maine in 1979 with a dream of building their own home and have a simple, natural life. Wendy, then 24, even went back to college to study the newest methods of farming in anticipation of their new life because “that’s what we thought we would do when we came up here.” Their hope was simply to lead a self-sufficient life. As she puts it, “we didn’t want to become big farmers.” The reality, however, was not easy. They first ventured into several businesses – from selling Christmas trees, to breeding German shepherds, to growing vegetables and herbs – all with limited success. To save money, they lived in “very primitive conditions” in a run-down old trailer without electricity, telephone or running water. The Newmeyers took showers at a local health club and sometimes took a plunge into Moose Pond Brook, which runs through their land, with a bar of soap. Out of necessity, Jack began harvesting and selling lumber from their 111 acres of land. Jack bought a used bulldozer and cut spruce and fir for pulp. Wendy, seeing all the waste that was made in the wood-harvesting process, soon realized that she could make use of her expert seamstress skills and extensive education in drying herbs and flowers to produce a second moneymaking item. Their savings, however, were almost depleted that even the $700 needed to buy the shredder (the heart of the operation) was a sacrifice. A $10,000 inheritance from her grandfather who passed away helped the family tide the difficult times. Wendy started her foray into the balsam business by selling the cut branches of the balsam fir trees for a local incense factory. Quite coincidentally, she had read in a book that Native Americans used balsam trees as herb for many different home remedies. With her long-standing interests in herbs, “that got me excited into thinking about it [balsams] in a different way,” said Wendy. She became a supplier to the incense factory, which used her balsam fir boughs to stuff souvenir pillows. She found other clients who wanted her balsam to make products such as decorative pillows, potpourri and other by-products. One client, a publisher of Herb Quarterly that Wendy subscribes to, was so happy to have found Wendy. This client was buying pillows from the incense factory that Wendy supplies and takes the pillows apart to get the balsam. The publisher, who needed balsam to make pillows, paid Wendy $1.75 a pound, compared to the $0.07 a pound paid by the incense factory. Wendy then launched into a mailing campaign, sending 300 targeted mails to herb businesses nationwide, asking them to buy balsam from her. The response was impressive: 125 placed orders. For about six months, the balsam fir boughs were her only products. However, Wendy realized that filling orders for raw balsam wouldn’t keep her busy year-round. She then saw the potential of balsam pillows, and began to wonder why no one was making nicer pillows, as the stores that she supplied balsam with only produced plain pillows. She figured that the tourism industry of Maine, with about 10 million visitors annually, could be a big market for souvenir products representative of the state such as balsam pillows. “I just want a tiny piece of that pie,” she said. “One morning, I woke up with a ‘BFO’ (what my SCORE counselor calls a blinding flash of the obvious), that it was up to me to make those ‘nicer’ pillows! Using skills and interests I had developed which until then seemed to have no correlation to each other, I began my company!” She opened Maine Balsam Fir Products in 1983, producing a line of balsam fir pillows with scenes of Maine embroidered on them. She started stitching together on her home sewing machine silk-screened fabric pillows that a graphic artist designed for her. She then filled them with her own fragrant dried balsam. To sell her balsam, she traveled across the state a couple of days a week with a trunk load of pillows that smelled like Christmas. She took a door-to-door approach, traveling throughout the state asking stores if they were willing to carry her product. According to Wendy, “The early customers did NOT beat a path to my door … I had to go out and find them.” Personally cold-calling the “best” stores in each town, she would show them her pillows, not wanting to give anyone a chance to say no before they could see what she was offering. After only two months, she knew that she made the right business decision. While her product line is very limited, “I was already supporting my family and was able to keep the business moving forward as well. ” Shop owners, who had seen her products in other shops, started calling her to supply them as well. By the third month, Wendy hired her first employees to help her fill the orders. She enlarged her product line, introducing more designs for her stuffed pillows, and started looking for customers outside of Maine. She sold to 169 stores that year. Through the years Wendy has experimented with trade shows, catalogue sales, the QVC home shopping network, and many other avenues to showcase her products. 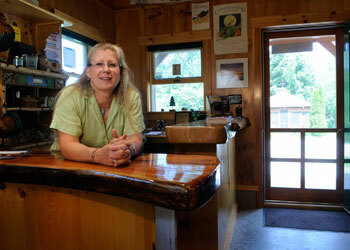 She recently set-up a web site, http://www.mainebalsam.com, to widen her market reach and take a dip on Internet retailing. Her worldwide outlets now exceed 4,400 stores and her employees have increased to 12. Sales of Maine Balsam Fir Products have reached over $500,000 per year. The first years in Maine were very difficult. The isolation of living in a rural area, loneliness and poverty proved to be the biggest hurdles in her life. “But my parents gave me a very good self-image and confidence. And so once I got into this direction, there was no turning back.” She credits her qualities of being a woman as a significant reason for her success. “Women, first of all, are very tireless workers. We’re very frugal by nature, and not complaining.” Almost all her early contacts were women, who proved very supportive to her. “It was a good thing, because the male encouragement was lacking.” Her own husband was critical of her for a long time, expecting her to fail. Instead of wallowing in disappointment from her husband’s lack of support, “I became much more determined to succeed.” Today, her husband Jack had built her a huge barn serving as the company’s headquarters and acts as her Raw Product Manager. Her greatest joy from being an entrepreneur, however, comes from being able to help her community. “I feel very good about the support I could give into my community.” She relates the story of one of the ladies who work for her, Denise. Since Wendy also employs Denise’s mother, the girl, who was then eight years old, complained that her mother didn’t have much time to play with them since the mother worked for Wendy. “I was feeling sorry about it,” said Wendy, until the little girl said, ‘But she just bought me new shoes!” The company has since won numerous awards and recognition for their economic impact on the community. Note: Article was first published in May 2000. Wendy Newmeyer saw the potential of balsam branches, considered waste products in her husband's logging business, and transformed it to sweet-smelling pillows and other gift items.